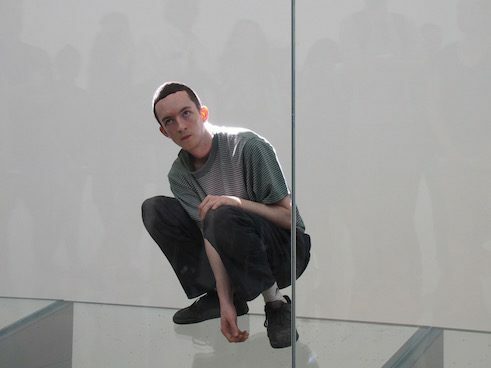 Anne Imhof occupies the German Pavilion at the Venice Biennial with her performance "Faust". As with her previous works, the overwhelming images for Faust were developed collaboratively. Exactly five years ago, she was awarded the graduate’s prize for her degree project at the Städelschule in Frankfurt, three years ago with the National Gallery’s award for young art in Berlin and now with a Golden Lion at the Venice Biennial. Nonetheless, it seems downright frivolous to describe Anne Imhof as a “shooting star”. It is simply incommensurate with her exceedingly precisely worked out, multi-media performances, and descriptions of this kind instead contradict the logical consistency with which this work has evolved into an enactment of several hours’ length. And above all, as Imhof always emphasises, she is never alone. The artist relies on collaborative within her team of performers, dancers, musicians and photographers, having demonstrated this already in her degree project, “School of the Seven Bells”. Introduced by a musical piece, they walked, they and 14 friends stood around, formed groups, parted once again, handed on metal rods like secret messages; a process that can be interpreted as a continuous give-and-take of resources – including cognitive ones. Can the mutual inspiration that accompanies one through one’s training and beyond be more subtly visualised? Through this collaborative work, in Imhof’s view, a greater and more complex image emerges. Images are the artist’s concern. 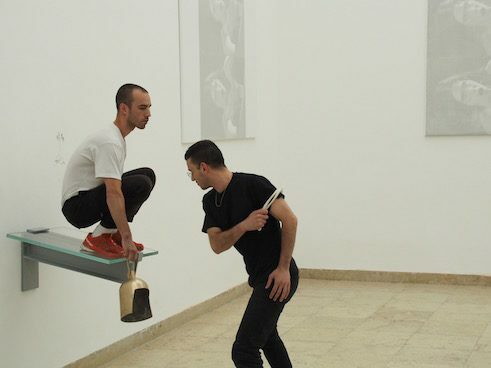 They consist of painting, sculpture, sound installation and performance. There is no playbook, no narration of any kind, not even pre-set action directives for the performers. It is important to Imhof that each participant has control over her or his own actions. Moments arise out of this freedom that are of relevance to her work. Despite this, she retains control over what happens. In the case of Faust in Venice, communication between the artist and her performers during the performance takes place via smart-phone. Visitors are not expected to stay from start to finish for this performance, conceived as several hours in length. The point is the image that each visitor takes away with him or her, no matter if they spend five minutes in the room, or five hours. Painting and sketching always play a central role in her artistic self-conception. Initial basic elements are established as sketches in her studio, then follows the rendering into other media. The issue is to discover a common, non-verbal language to communicate on a single level about the different renderings and to find corresponding formulations for the process. Only in this way can the various intermeshing media create the atmosphere that ultimately allows the image to arise. “Anne Imhof is an artist who looks at society, the individual and the body with such a contemporary as well as clear realism,” as Susanne Pfeffer explains her choice. She has been observing the artist’s work from its beginnings. Faust is the title of this long-term scenario of five hours’ length. The title alludes of course to German cultural heritage and Wolfgang von Goethe, but it is quite literally about the clenched fist. It is about power, powerlessness, violence, resistance and in the end about their counterpart: freedom, since each and every individual’s freedom of thought is central to Imhof’s pieces. Imhof occupies the German pavilion, this fascistic building from the 1930’s, with her work. The grounds were fenced in, four Dobermans guard the front section. The performers have taken their positions on the façade, on the fences. The built-in walls, consoles and the additional level are made of glass, they engender new interrelationships in this space. This is familiar from institutional buildings or banks, where transparency is stage-managed and power demonstratively shown. The performers seem abstracted, there is a lot of walking, bodies come to a halt in conglomerates, heads pressed – utterly uninvolved – against walls, motion sequences frozen into poses. An archaic naturalness emanates from these images, as if they had always been there. 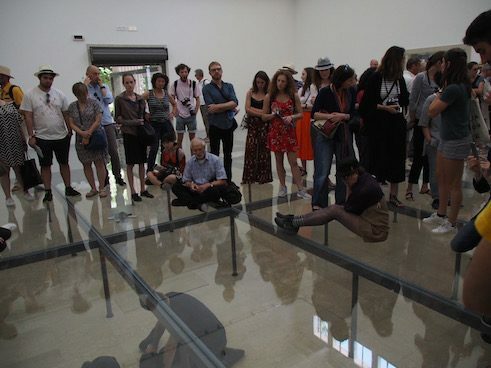 Although the performance takes place above, below and around the viewer, the latter remains strangely unaffected, is not included in what is happening. For Anne Imhof, precisely this distance is what is important. Would these memorable images arise in any other way? © Photo Nadine Fraczkowski Anne Imhof was born in 1978 in Gießen. 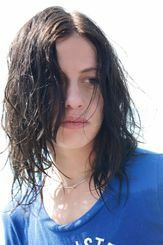 She began her training at the Hochschule für Gestaltung (University of Art and Design) in Offenbach and continued at the Städelschule in Frankfurt. In 2012 Imhof was a master-class student under Judith Hopf. Most recently Angst, her three-part operatic cycle of works, was performed in Basel, Berlin and Montreal. She lives and works in Frankfurt.